A new email product on the market aims to help dads help moms with baby care—without being asked. Daddy Caddy's founder discusses why emails work. Being a new parent can be tough—and there's no manual. That's why Catharine Griffin and her husband developed Daddy Caddy, a new email subscription that works as a guide for first-time dads. It's a concept that can certainly be of use to all new dads, regardless of their lifestyles or age groups—but it's especially useful right now, when traditional gender roles have shifted so much over the years and dads have just as much of a role to play as moms when it comes to bringing up baby. The set-up is simple: For a flat fee of $5, Daddy Caddy sends one tip a day, every day, for 30 days. "These are meant to help new parents survive that first month," says Griffin. "They're simple tasks that are easily overlooked or forgotten when you're overwhelmed and running on fumes—things like 'add baby to your health insurance.' The daily email acts as an automatic prompt, so that dads don't have to consult a book or search online." 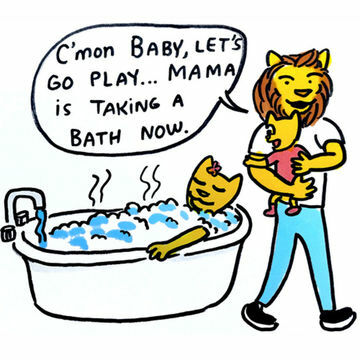 But Daddy Caddy also brings an element of fun to that stressful first month with a new baby—especially since news is dispensed by a cartoon character named Papa Lion. 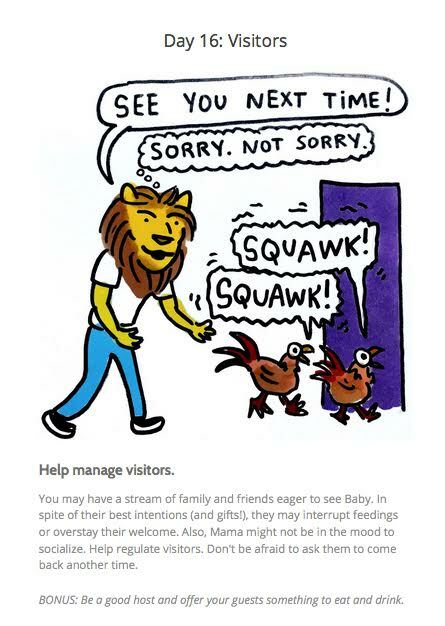 "Each tip is playfully illustrated by Drewtoonz, who created the Papa Lion character to empathize with new dads. It's meant to be lighthearted, not preachy. 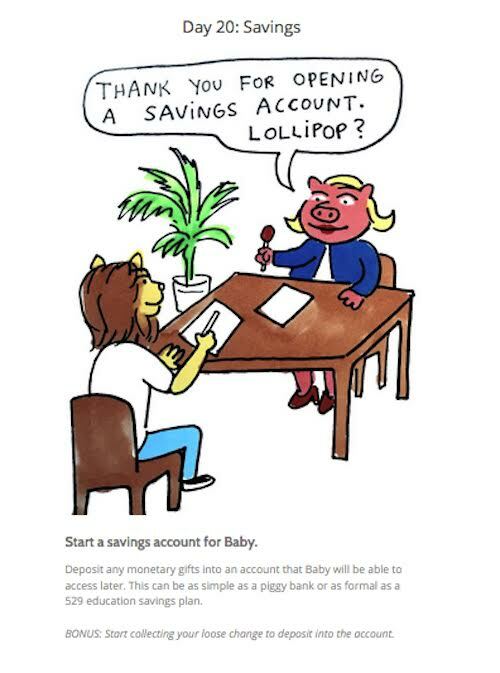 So even if the dad doesn't feel like reading or taking someone else's advice, he can just look at the daily cartoon in his inbox and chuckle. On the other hand, if it's an overachieving dad, each day comes with a bonus tip if he feels like going above and beyond the call of duty," Griffin says. The idea was inspired by Griffin's own experience as a parent. "My husband and I came up with the idea for Daddy Caddy after the birth of our daughter last April," she says. "Those first few weeks were a time warp of baby care and I was astonished by how little else I could accomplish. Plus the sleep deprivation and crazy hormones made everything seem even more urgent as chores piled up. My husband wanted to help, but of course, he couldn't read the to-do list my mind was creating: mail out thank you notes, restock the diapers and wipes, get batteries for the swing, etc. None of the baby books we had offered any of these suggestions, so we thought it would be a good idea to help answer the question 'what can dad do to help?' so that tired moms don't have to." Daddy Caddy's tasks include things that should be done when both parents are at home, but it's certainly not just for stay-at-home dads. "Daddy Caddy is geared toward all dads! Obviously it's easier for dads to help immediately when they're home, but there are a lot of thoughtful things that dads can do before/after work, on even to/from work. My husband had to go back to work when our daughter was two weeks old, but one of the most touching things he did was surprise me with birthday cupcakes that he picked up on the way home to celebrate her one-month birthday," Griffin says. The suggestions put forth by Daddy Caddy aren't mandatory; they don't have that to-do list feel. With that being said, Daddy Caddy can help new fathers consider tasks they may not have even thought of without the tool. 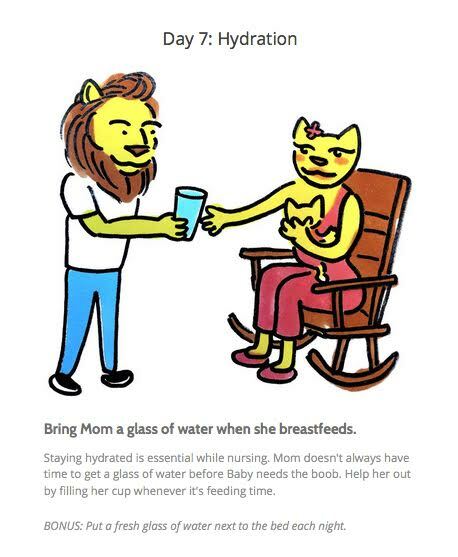 "Even if dads take just a few of the suggestions, it will offer some relief for moms—which translates into less emotional drama for dads—because every thing that dad does is one less thing mom has to do or worry about doing," Griffin says. "Plus, if a woman adds something to the 'honey-do' list it comes across as nagging; if her partner does it voluntarily, all of a sudden it turns into a considerate and thoughtful action. So I hope it takes little annoyances that can eat away at relationships and turns them into things that strengthen the relationship instead." According to Griffin, Daddy Caddy isn't just a tool that's perfect for fathers to use when they first become dads—it's also the kind of tool we need in this day and age. "At a time when there's so much pressure for women to 'lean in,' to push harder, to do more, I feel like it's important for women to recognize it's okay to ask for help," Griffin says. "Super-overachieving women can think of it as delegating, even! In the end, the most important thing is to embrace this time with your new baby because as everyone told me ad nauseam 'it goes by so fast.' Because it does. The first month with a newborn is one of the most special times in your relationship, so who wants to waste time quarreling about trivial things that don't really matter in the big picture?" Daddy Caddy's formula is simple. "Happy Mom —> Happy Baby —> Happy Family," according to Griffin. "We're rooting for all the new daddies out there! We know they're trying their best. We hope Daddy Caddy makes their best even better," she says.